We like the book and in addition to the literary aspects of the book, the subject of the book is also quite interesting or rather we say “important”. At one end, we are talking about scientific achievements and better living conditions, a large number of people around the world are living a life without identity. It is not easy to understand the pain faced by the refugees and those who are living in the crisis of even their national identity. 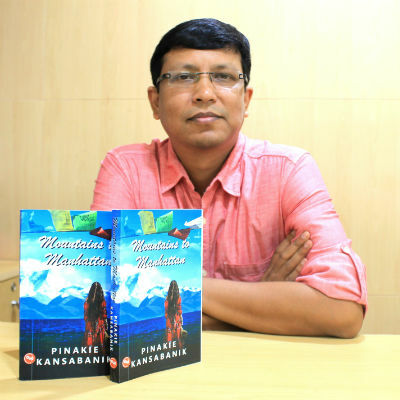 Pinakie took a stand on what he believes in and decided to convey his feelings to the world by the medium of a book. And this is how – Mountains to Manhattan – came into existence. I come from a charmingly sleepy town of Siliguri, located in the foothills of the Eastern Himalayas in Darjeeling district of West Bengal. I now reside in Delhi-NCR. I am completely brought up in Siliguri and an alumnus of Siliguri Boys’ High School. My 1st job was of a computer teacher in Tashi Namgyal Academy, Gangtok. At a very young age I was in the middle of the Tibetan culture and was in deep love with the culture. Later my several visits to the Tibetan Refugee Camp in Darjeeling made me inquisitive about them. Out of curiosity I started reading all that I could read about the Tibetans and my research went in deep to know more about them. Later on I moved to Sherwood College in Nainital and again got interested in them while visiting the refugee market beside the Naini lake at Malli taal. I also worked for few years in Caesar School Malbazar (West Bengal) before moving to Delhi and start a career in international conference and exhibition. In Delhi, I made a few Tibetan friends became more aware of the Tibetan plight of being a refugee and their dilemma. Other than writing my passion is to roam / trek in the mountains. The urge to tell a story was the only inspiration to write. I have so many stories to tell…so the best way to tell them is to write. What gives you the courage to stand for Free Tibet movement? I felt it is a pain for a race to be refugees for four generations. Though the refugee diaspora often assimilates after a couple of generations still their political identity doesn’t change. The populace in the host country starts believing that they belong to the country but only the refugee diaspora knows the truth. So, the courage comes from the research I have done and the pain I have seen which gave me the conviction to stand by them by telling the Tibetan refugees story of challenges and dilemma to the world. I also feel it is our moral responsibility as a creative artist to stand by every movement, thought, principal that I personally believe. What inspired you to write “Mountains to Manhattan”? No one has written so closely in a form of a fiction about the nationality crisis faced by the Tibetan people in India, I thought of giving a voice. I always believe a fiction is a popular media to take a serious issue to the general populace. Usual journey as every writer faces. I wrote to a lot of publishers about a year back but most of them refused. I finally got offers from two publishers, one from Delhi and the other from Mumbai. I had chosen the Delhi publisher. Can you share your vision for the cover page of – Mountains to Manhattan? While reading the book “Mountains To Manhattan” I found that you have studied many cultures (of course Tibetan culture is at the core, but the German and US ways of living are explored well too), had you been at the places or you researched through media? Can you tell us more on that? I have not been to any of the places other than New Delhi. Every description that I wrote is extensive research through media and books and later on I verified the facts from the people whom I knew had stayed at any of those places. What I like the most in Mountains to Manhattan are: (a) The way the innocence of village people living with a tiny set of resources and how they enjoy the life and (b) The relations between various characters are weaved – especially the pure friendship between the protagonist and her former boss Can you tell which part(s) / scene(s) in the book you enjoyed writing the most / like the most? I loved writing the entire book. Every line, every page is very important for me and close to my heart. I cannot pick up any particular part /scene from it. Like the scenes of the school life come from my experience being a teacher in my younger days. The way I saw the students used to behave. The Coorg part resembles my experience of tea plantation in Darjeeling hills with media inputs on Coorg and so on. I come from a small town and my experiences with mountains, sky, stars, identifying the constellations etc. all reflected in the book. Why should one need to read – Mountains to Manhattan ? There are many reasons for it. At first, it speaks of a pristine culture and a struggle for its survival and it upholds human aspirations and its subtle nuances. The book is gender sensitive and written from the depths of the author’s heart and not merely for the sake of writing. It reflects the family values and solidarity in struggle; it is a celebration of feminine courage and youthful dream of an aspiring adult. It is also a classic in its own right because it is the first novel about Tibetan nationality crisis. Why the book ends with the hope of the good future rather than showing it achieved? What is your vision behind it? The concept of “Good future” is relative. It varies from man to man and from time to time. What is good future for one today may not be tomorrow once that is reached. Could had that been possible to achieve then most of us would have lived a happy and satisfied life. As one reach a desired future and then yearn for more and new challenges come up. I could have brought in Lhamo’s husband and make her settle in USA with a green card but it doesn’t happen that way. That would have been an ideal happy ending but I wanted a realistic ending. It is the hope that keeps us moving. The hope that gives you the strength to struggle.It just got reflected on my story. I am a method writer. I do all my research, jot them down, plan out the plot and then start writing. When I write, I am deep into the characters, place and time. I prefer writing at night and I write at a stretch for days. If I take a break then I lose the involvement. I love to read anything that’s interesting but not very fond of romance. Among the English writers, I like John Grisham, Dan Brown, Khaled Hosseini, Ashwin Sanghi. EBook is getting some popularity and it is fine with me. With the changing technology the younger generation will switch on to new technologies and we should welcome it. But a recent survey has suggested that 62% of 16- to 24-year-olds prefer reading printed books to ebooks on an e-reading device. Over half of those who preferred print said they “like to hold the product” that they are reading. That means they want to have a strong emotional attachment to the physical book, as demonstrated by the qualitative comments made by participants, such as “I like the smell” and “I want full bookshelves”. So, ebook will take time to take over. What is your opinion about various social networks and the way it can be used to spread awareness about some important cause around the globe? Today the most important media is the social media. With its own pros and cons I find it to be the strongest media to spread awareness about any cause around the globe. The social media is accessed from very personalized device i.e laptops or phone, hence, it gets the highest level of attention. It gives us worldwide connectivity, commonality of interest and real-time information sharing. Nothing can be as strong as social media. Yes, we are. With the evolution of nuclear families, most of the kids do not have the luck to stay with grandparents. Moreover, the parents are working, hence, the kids are left with the smartphones. So the moral and ethical stories from grandparents are replaced with the Japanese cartoons.